A slightly earthy and mildly sweet greens mix that takes advantage of the beneficial properties of carrot, lemon & ginger. Greens 5 is a complete profile of trace minerals and vitamins that has a comforting and smooth root vegetable undertone with just a hint of citrus. 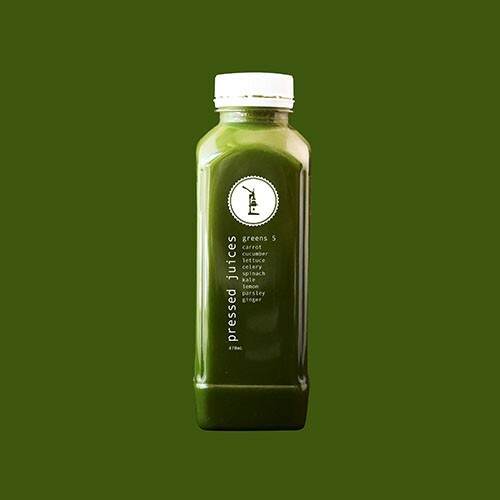 Cucumber, spinach and lettuce provide a crisp and refreshing body while the parsley and kale add a subtle bite to complete this balanced and potent combination. This juice does wonders for your skin, eye health and immune system by fortifying our first line of defense; the sinuses and airways! Assists in improving eye health. Consuming Greens 5 alongside our PJ OJ to make for an extremely effective immune boosting tonic, especially when sinus and respiratory infections are present.